So, I created our Boredom Buster Jars. If you were around last week, you saw that I actually made ours from craft sticks… because I have high hopes they will last longer that way and I can add to them as I need to. But, I also made a printable version. Because, let’s face it, it took me FOREVER to write out all those darn sticks. Seriously, probably about four hours. No lie. So, if you have better things to do with those four hours of your life, maybe a printable version is the way to go, eh? You’ve got a paper cutter and a DVR’d show to keep you company and speed the process along, right? Not necessary, but it may help. The Sneak Peek version (this freebie I offer here on my blog) has 24 activities. There are four activities in six different categories. The label page has labels that will fit both a narrow mouth or a wide mouth canning jar lid. A clean, plastic peanut butter jar is a great way to go too, and a little more kid-friendly. Follow this link to download a single PDF with the three pages you’ll need to complete your sneak peek jar. 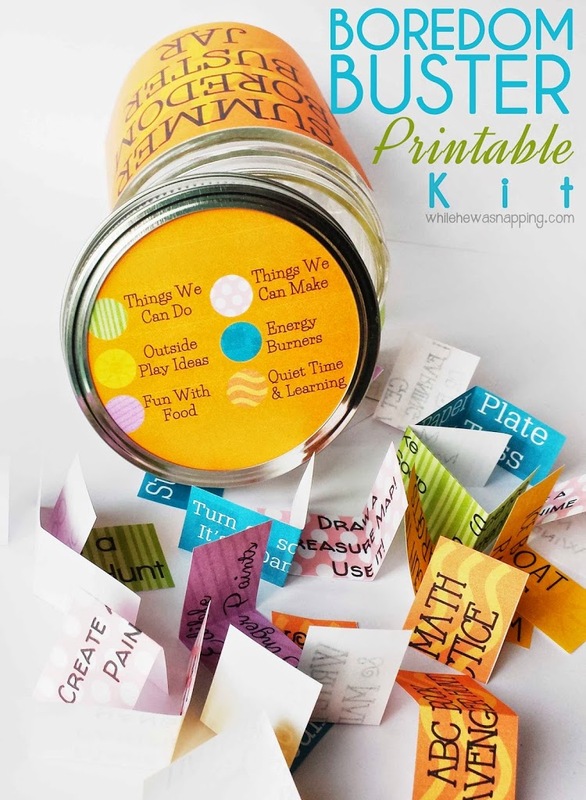 – Download and print out the PDF Boredom Buster Jar Printables. – Cut the activity cards apart with the scissors or paper cutter. – Fold them in half or quarters and put them in the container. – Choose which labels you want to use from the print out. Cut them out and adhere them to the container with tape, glue or string. Boy do my kids need one of these! In fact, I’d better go downstairs, turn off the tv, and send them outside! What an awesome idea! Even though I don’t have kids I love the idea of having one of these at home for when family come to visit or friends with kids. Thanks for sharing! I think I may try this. I have a preschooler and a baby and need new ideas! The baby takes up so much of my time, I need new ideas to keep my older one busy. Thanks for sharing.